The purpose of this study was to examine the intra- and inter-day reliability of body composition measurements provided by a commercial multifrequency bioelectrical impedance meter. Eighteen healthy, well-trained students in physical education from the same ethnic group were assessed on four consecutive days, both in the morning and in the evening. Indexes provided by the device were gathered in four categories: tissular, metabolic, hydric and ionic blocks. There was no systematic bias between repeated measures, regardless of time of day. Relative reliability was high to very high in the morning (0.72<ICC<0.99) and moderate to very high in the afternoon (0.61<ICC<0.99). Absolute reliability varied substantially between indexes (1.5%<SEM<15%). The minimum difference considered as real was proportionally altered, since it ranged from 4.2 to 41.5%. 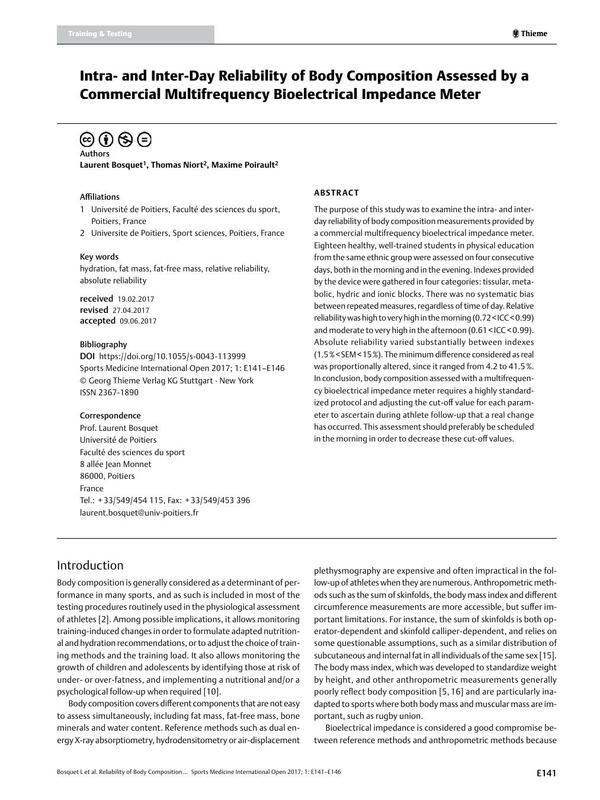 In conclusion, body composition assessed with a multifrequency bioelectrical impedance meter requires a highly standardized protocol and adjusting the cut-off value for each parameter to ascertain during athlete follow-up that a real change has occurred. This assessment should preferably be scheduled in the morning in order to decrease these cut-off values.